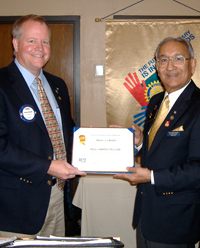 District governor Ajoy Chatterjee (right) presenting a Paul Harris Fellow award to Partners Steve Lillestol. Note: This article was imported from the previous website. The “by line” above is inaccurate. The Thief River Falls Rotary club received a visit from the district governor, Ajoy Chatterjee. His visit is one of 66 club visits he will make during his tenure as District Governor. Chatterjee, as district governor, is responsible for visiting each of the 66 Rotary Clubs that are Cubs in the Rotary District 5580. This is quite a task given that this district comprises 240,000 square miles, and includes the entire state of North Dakota, Thunder Bay, cheap jerseys Ontario, Fergus Falls, Little Falls,and Duluth, Minnesota, and Ashland, Wisconsin. Chatterjee has been traveling throughout the district since July 2009. He has been home only three times since then. The district governor visits each club in the district. In Thief River Falls, cheap jerseys he gave many awards. One award was bestowed to the club president, Steve Lillestol; he was given the Paul Harris Fellow award. This award is given to Rotarians who provide a financial gift of one-thousand dollars, or more, to The Rotary Foundation. These funds are then use to fulfill the mission of Rotary International. Chatterjee also was the master of ceremony while recognizing new Rotary Club members. His duties were to provide a lapel pin to new members. This ceremony took place during the regular Tuesday noon meeting at Best Western.